Posted on Sun, Dec 18, 2011 : 5:28 a.m.
With well-known Ann Arbor composers like William Bolcom, Evan Chambers and Michael Daugherty in the local viewfinder, it doesn’t take much to convince listeners how exciting and appealing contemporary classic music has become. Add another name to your list, in case it’s not already there: James Aikman, 52, who divides his time between composing and teaching as a guest lecturer at the University of Michigan and acting as director of composition for the San Miguel International Chamber Music Festival. His compositions are already the talk of the music world, and he’s won many honors and commissions. Now he writing a string quartet for the Parker Quartet, and he has a new work for the distinguished American flutist James Pellerite, that combines Native American flute, chamber orchestra and electronic media. The violin concerto, “Lines in Motion,” that headlines his “Venice of the North Concerti” disc for Naxos was a nominee for both the Pulitzer Prize in Music and the Grawemeyer Prize. 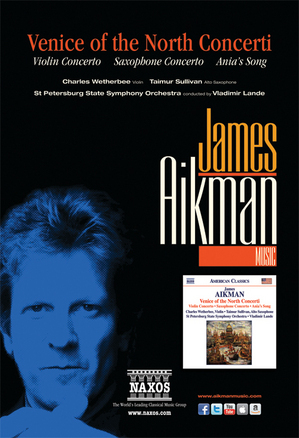 Vladimir Lande, the conductor who leads the St. Petersburg State Symphony Orchestra on the CD—in the violin concerto (with Charles Wetherbee as the excellent soloist), “Ania’s Song,” and a saxophone concerto with soloist Taimur Sullivan—is already proposing an Aikman double concerto for a prestigious team, violinist Sarah Chang and pianist Xiayin Wang. Like Bolcom, Daugherty and Chambers, Aikman has his ears wide open to the sounds around him. His music is a personal, fresh amalgam of many influences; he mines the classical heritage and a wide spectrum of classical techniques as well as pop, jazz and rock. Electronic music has also influenced his composition. Rather than blocking out some of this music—using aesthetic filters, as it were—“people have begun to express all the possibilities that this palette offers,” he says. Good music, from recent years, is what fills his newest CD. You can sample some of it online, along with other compositions, on his engaging website, aikmanmusic.com. Why the title “Venice of the North Concerti”? Well, Aikman spent time in one of these “Venices”—Amsterdam—as a Fulbright scholar, in 1994, studying with famed Dutch modernist composer Louis Andriessen. It was a formative experience he wanted to honor with the CD title. And then, there is that other Venice: St. Petersburg. That’s where the CD was recorded, in a close collaboration with the musicians of the St. Petersburg State Symphony Orchestra. “I knew the orchestra, and that provides a bit of comfort, knowing the group of people you’re writing for. They were also incredibly prepared, and we had so much rehearsal time,” he said. Conductor Lande, who is the orchestra’s principal guest conductor, has also been a champion of Aikman’s music. It was Lande who, having heard Aikman’s third violin sonata on a visit to a mutual friend in New York, suggested that there should be a violin concerto. “I was meaning to do that anyway,” says Aikman. Lande provided the push—and the offer of a premiere for the work, a complex, intricate piece with a gorgeous central movement. The violin concerto collaboration went so well that Lande asked what was next on the docket. A guitar and violin concerto that was in the works morphed into a concerto for saxophone, and it, too, found its way onto the current CD. The third work—a lyrical bridge between the other two—is “Ania’s Song,” which was premiered not in a Venice of the North but in the Cambridge of the Midwest—Ann Arbor—by U-M conductor Kenneth Kiesler, whom Aikman also cites as very supportive of his work. Ann Arbor figures in the CD in other ways. It may have been recorded in St. Petersburg, but it was mastered in Ann Arbor, by Eric Wojahn of Solid Sound Recordings. The U-M’s Andrew Mead wrote the liner notes. And Mead got it right when he wrote: “ The music on the current recording moves with comfort and surety from pop to jazz, from Schubert to Prokofiev, Barber and more modernistic impulses. Sharing the music is what excites Aikman most about the recording.